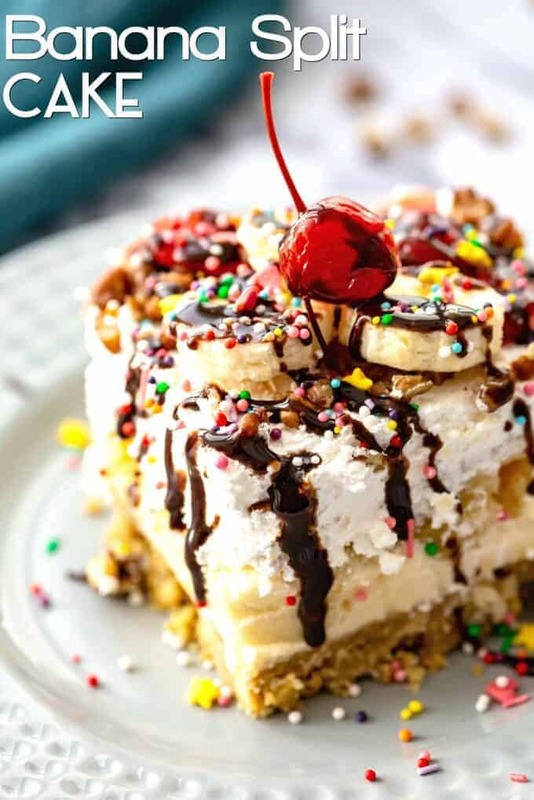 No Bake Banana Split Cake takes your favorite banana split hot fudge sundae and combines it with our easy icebox cake dessert! Layers of bananas, crushed pineapple, a graham cracker crust and topped with whipped cream and drizzled with chocolate! Of course, you cannot forget the maraschino cherry on top! Classic desserts are always a hit! My family does a happy dance whenever we make our “better than the bakery” Rainbow Sprinkle Cookies and our No-Bake Eclair Cake. 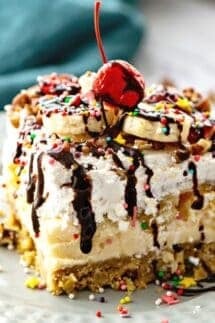 If you are looking for the perfect dessert to feed a crowd, this No-Bake Banana Split Icebox Cake is the perfect solution. Every time we make I bring it to a neighborhood barbecue or potluck dinner, it makes all of the other desserts sad and lonely because this one gets so much love! I swear, I should just start bringing the recipe with me when we serve it because everyone asks for it! This recipe only takes a few minutes to pull together, but the best thing about it is that it can be made up to 2 days in advance. Perfect if you are planning a party and want to get some of the work out of the way!! AND, it is no-bake, so you don’t have to use oven space for it. Just pull it out of the refrigerator and it is good to go! Some people like to put a layer of sliced strawberries in as well, those are a great addition (and look really pretty too!) As I mentioned above, if you are looking for a nut-free dessert, just leave them out! Making this old fashioned Banana Split Cake is super easy. Let’s be honest, if it wasn’t easy, it would be on my site! It is more of an assemble than cook! It is all about the layering! The first thing you are going to do is beat your eggs at high speed. You want to do this until they are light, about 4 minutes or so. Next, add in the sifted powdered sugar, soft margarine, and vanilla. Beat the mixture for about 5 minutes. 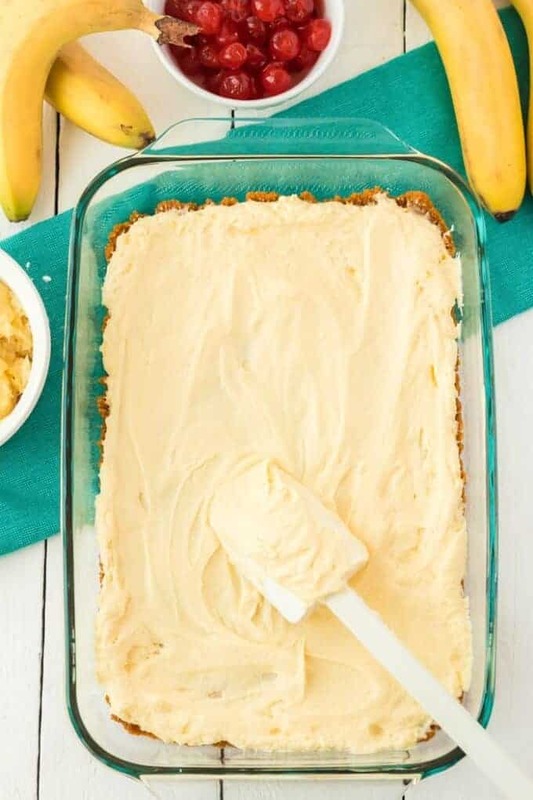 Then, you are going to spread graham cracker crumbs along the bottom of a 9 x 13 cake pan and spread the mixture over the top of graham cracker crust. Place in the refrigerator and chill for about 30-40 minutes. Take the dish out of the refrigerator and spread the crushed (and drained) pineapple on top of the mixture. 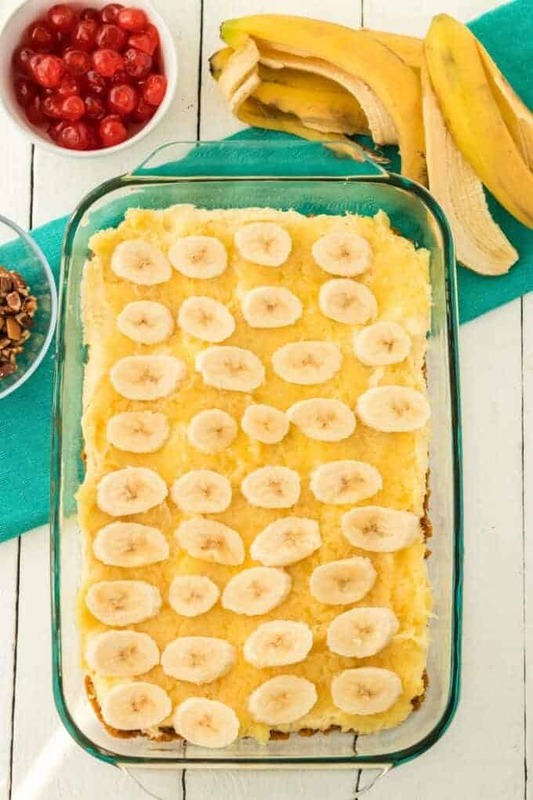 Place the banana slices in a layer over the pineapple and cover it all with the whipped topping. Sprinkle with pecans (optional). Cover and refrigerate for 6 hours or overnight or up to 2 days. When you are ready to serve, place a few extra slices of banana on top along with your maraschino cherries. Be sure to drizzle with chocolate or hot fudge! 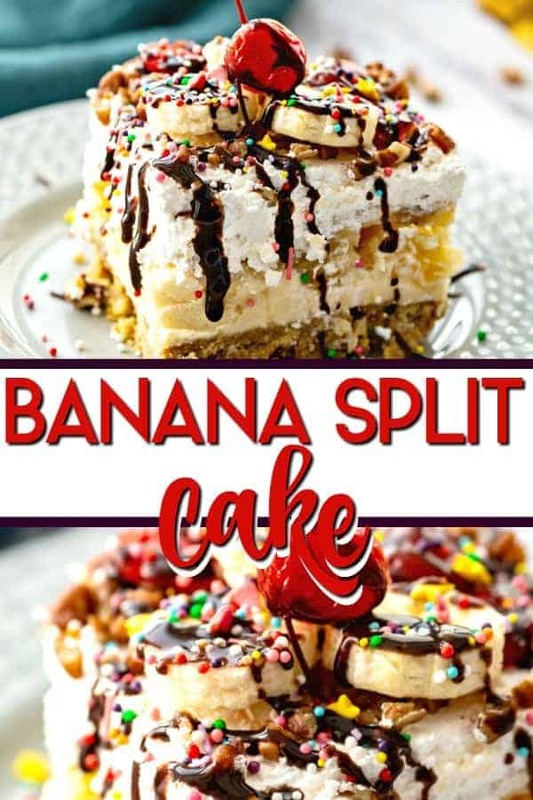 No Bake Banana Split Cake takes your favorite banana split hot fudge sundae and combines it with our easy icebox cake dessert! Beat eggs at high speed until light, about 4 minutes. Add powdered sugar, soft margarine, and vanilla extract and beat for about 5 minutes. Spread graham cracker crumbs along the bottom of a 9 x 13 cake pan and spread mixture over top of the graham crackers. Chill in the refrigerator for approximately 30-40 minutes. Drain the can of crushed pineapples well and spread the pineapple evenly over mixture. Slice the banana and layer the banana slices over pineapple. Spread the Cool Whip in a layer over the banana and sprinkle with pecans. Cover and refrigerate for 6 hours, overnight or for up to 2 days. When ready to serve, add a few more slices of bananas on top along with your cherries. Drizzle with chocolate or hot fudge. no bake desserts are always the best desserts! Oh yum! This sounds like a wonderful piece of heaven! 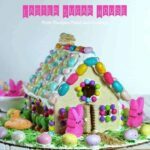 This cake is so much fun and DELICIOUS! My kids really loved it! 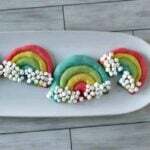 Such a fun treat! 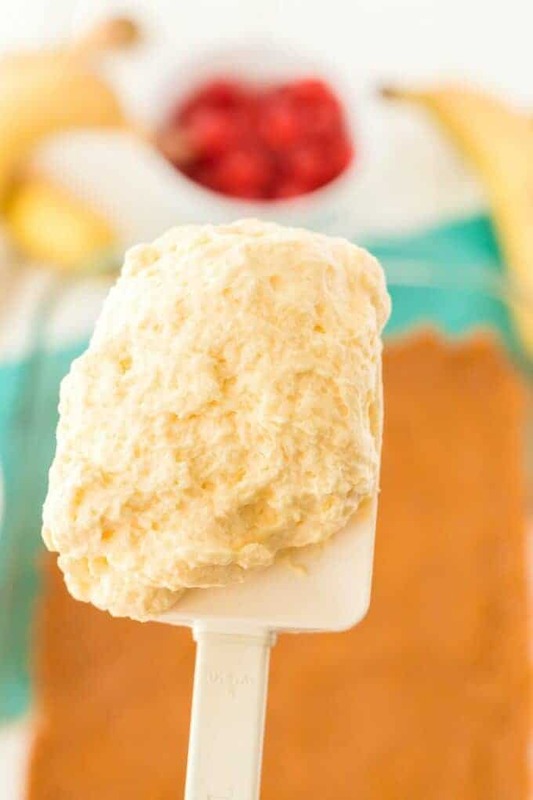 Swooning over this perfect Summer dessert!